Note: A slightly modified version of this post appeared in Casino Journal’s September edition. Across the US, businesses have started a new fiscal year. You attended a variety of conferences, trade shows and networking events. Everyone who was going to plan on you in their 2017 budgets are taken care of. Now what? In my years on the operator side, I talked to many salespeople. I heard many more partial voice mails and saw (not read) more emails. Being a salesperson is a daunting task, but in the casino industry it is a little like rolling a boulder up a hill. My hat is off to you. You’re the person that must interrupt someone’s day – a day that can include anything from multiple meetings, to handling a customer complaint, to scheduling staff, to figuring out how to do more with less. It’s a tough gig. 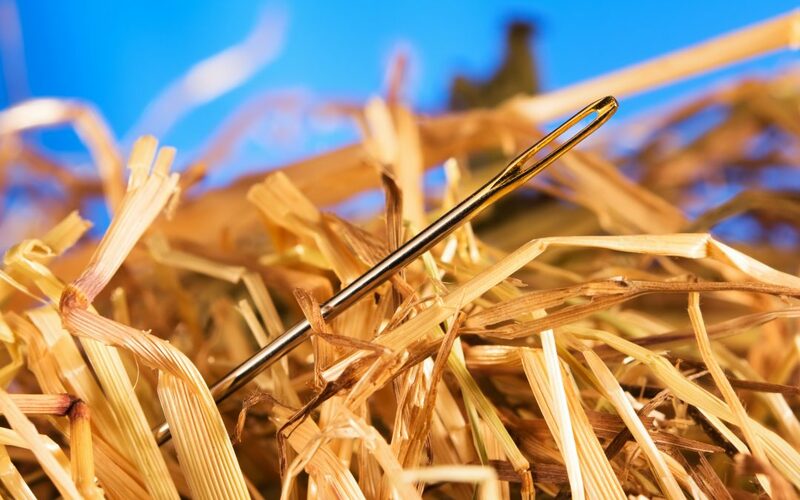 It’s like finding a needle in a haystack, only you’re the needle hoping a casino is going to want to look for AND find you. That haystack gets bigger by the day, if not the hour or minute. Hubspot estimates the “average human today is inundated with over 2000 outbound marketing interruptions per day and is figuring out more and more creative ways to block them out”. Rather than hoping potential customers hear or see your message, I think it’s time to help them “find” your message. According to a 2015 SalesforLife report, 77% of B2B buyers said they waited to talk to vendors until they did some independent research, and 65% of buyers felt vendor content impacted the final purchase decision. Those numbers will only go up…and quickly. Inbound marketing is a relatively new methodology that is seeing adoption across a number of industries. It’s about using your marketing to bring people to you rather than pushing your marketing out to compete in a crowded landscape. How do you get in front of people who aren’t taking your calls? How do you get your information in front of buyers who are doing their own independent research? How do you get on the consideration list your target is developing? There are many parts that make up a strong inbound strategy. It breaks down into two general stages. First is information and content that can get you found by your targets. The other stage consists of landing pages and lead forms and the mechanics that add important information to your CRM system to help your salesforce. What follows is a way to start the part of inbound that gets you found by potential buyers. Ask questions of your current customers, or ask questions of your targets (or look-alike friends if you can’t access your targets just yet). Then take the time to build buyer personas. In short a buyer persona is a fictionalized representation of your potential customer. It generally includes details such as demographics, behavior patterns, motivations, and goals. These personas will help you stay focused as you develop your tools. You should attempt to be as detailed as possible. Try giving them a name. Grab a photo online so that they have a face. Remember to adhere to usage rights. If you’re using something internally, you’re generally ok. If you’re going to make something public, you may need an inexpensive rights-managed photo. Put these personas up in your office or conference room so that you don’t forget who these people are. Remember that for most purchases you’re dealing with more than one persona. For instance, if you’re selling marketing technology, most of your communications are typically with the vice president or director of marketing, but who else will influence that purchase AND the successful outcome of that purchase? IT? Finance? How about that database marketer who has been using one tool successfully (perhaps in their mind) and now has to adapt to something new? What about the general manager? Do they have to approve the purchase? What questions or concerns will any of these additional people have? Paint a good picture of each persona involved in the purchase decision and usage. As part of understanding your audience, understand the challenges they are facing…honestly. Don’t assume that because you developed a great tool, it is necessarily a solution they see as worth paying for. Once you understand the problems that your solution CAN solve, it’s time to start thinking about content. There are a couple of tools I use that I would highly recommend to enlighten you in your quest for the right content to develop. The first is the Google Adwords Keyword Planner. It is free to use and allows you to see what keywords people are using to search for information or answers to their problems. Another tool I use is Keyword Tool. It allows you to type in a keyword to see additional keyword suggestions and, in some cases, it even gives you suggestions for questions you could answer. That part is great for developing content. If you’re using Adwords to advertise already, your Google Analytics will even show you the search queries people used to get to your site. Based on the clicks and engagement measures, you can decide if you have an opportunity to develop new content (or just update the existing content). If you want to have some fun, try Answer The Public. Your Domain Authority (DA) predicts how well your website will rank on search engines. Obviously, the higher the number, the better, but having a low number doesn’t mean you can’t play in the game. It just means you need to work a little harder, but that’s what we small business owners do every day. Right? You can increase your DA with a little effort and patience. One way to do this is by increasing the number of good links to your sites (preferably from sites with a higher DA than you), improving the overall SEO for your site (tags, keywords, navigation, site structure, etc.). A big piece of the puzzle, maybe the biggest, is creating content…lots of it and content people will want to link to. How do you develop clickable content? Where do you start? You can do this in-house, via outsourcing or some combination of the two. Idea generation is one of the biggest steps. Many ideas will come from your keyword research. There are also some great free online tools you can use. I like Hubspot’s Idea Generator, but just Google “blog idea generator” and you’ll see a few options you can try. Now you have a bunch of ideas, how do you start creating? First you need to think about your overall business and marketing strategy. Remember those plans? It’s important that your content marry up with your overall strategy. Much of this investigation may open up other avenues for you. So you may want to revisit your strategy to see if it’s still right for you. After you’ve done your strategy checks I recommend you start to map out your content. Think of it as a bit of a content family tree. At the top is THE keyword or phrase that you are the most competitive with. The next level is two, three or four questions your target (persona) has that you can answer either by updating content on your site (sometimes just utilizing the keywords that they are using that you do not have on your site) or by creating content that is used either on your site or distributed in some other form. The next level after that are three or four smaller subtopics related to each question. These become your white papers, presentations, videos, columns, webinars, etc. It’ll take time to go through this, but once you do, you’ll actually have a good 90 days’ worth of content! In addition, remember those links we talked about? When you submit content to a third-party with a higher DA than you, that link back to your site, helps your DA increase. By now, you are wondering why you wouldn’t just put your content on your site instead of submitting the to third parties. Well, if your site were the only thing that comes up in a search when people look for something, that would make perfect sense. In reality, multiple sites show up as possible answers to a search query and the higher the DA, the more that site will show up before yours. The more of those links are to content developed by you, the more the search engines start to think of you as the expert. Logic follows that if you’re the expert, your company must also be expert. While some vendors are beginning to use social media as a channel for selling, they are only beginning to scratch the surface and some aren’t using social media at all. According to SalesforLife, sales people using social media as part of their sales process exceeded their quotas 23% more often than those who didn’t. The same report indicates that non-social media users missed their quota 15% more often than their social media-using peers. I haven’t met a single salesperson who doesn’t want to outperform the competition. In addition, a recent Google update made social links even more important to increasing your website’s rank. It seems the time is now to start mapping out a strategy for using social media that is consistent with the habits of your buyer personas. With a solid content strategy, a pay-per-click (PPC) plan will help you get more visitors specifically looking for your content. If you’re great at PPC, you are more than halfway there. If you’re just starting out, you may need to either find a tool that integrates with your campaigns and gives you smart suggestions or you may want to find an agency partner to work with you (hmmm…I think I know someone.) PPC is more than just setting up an ad and some keywords. You can inadvertently be competing against yourself in bidding and end up paying more than you should. You can get really great click thru rates on keywords that don’t produce any level of engagement. There are even negative keywords you might be showing up for that are creating clicks you’re paying for. Unfortunately, it’s easy to see clicks and impressions as “success” and keep spending. The key is to understand which keywords are right for you and the type of content you’re providing so that you can optimize your budget rather than spending more. For many years, companies sent out press release after press release just hoping their quotes could be used in articles. B2B companies will find that evolving to a thought leadership campaign can be much more powerful as it can create a competitive advantage. Thought leadership can encourage future (and present) customers see your company as the resource for information and insights. Thought leadership is more about promoting ideas that are relevant than it is promoting your company. By joining the conversation, you can become recognized as the eminent resource in your field, eventually leading the conversation. It shows you walk the talk. It reverses the direction of public relations to you so that you can advance the industry conversation. The sales process and the role of sales is ever-evolving. We are sure that it will be radically different in five years or fewer. How are you adapting to this new, well-educated buyer?